Scientists have known for about five years that mutations in the gene TREM2 increase a person’s risk of developing Alzheimer’s disease. Now, UCLA researchers have shown in mice that boosting levels of the TREM2 protein could help treat people with Alzheimer’s. TREM2 makes the brain’s immune cells more effective at fighting disease and protecting brain cells, they report in the March 7 issue of Neuron. More than 5 million people in the United States — and 47 million people worldwide — currently are living with Alzheimer’s disease, the most common form of dementia. Efforts to uncover genetic variants that make people over the age of 65 with no family history of the disease more prone to Alzheimer’s have recently pinpointed a number of genes that might contribute. In humans, researchers have discovered that subtle mutations in TREM2, which likely impair its function, markedly increase a person’s risk of developing Alzheimer’s in old age; only the gene APOE4 conveys a higher risk. In addition, more severe loss of TREM2 function leads to a rare genetic disease whose symptoms include early-onset dementia and bone fractures. Scientists suspect that TREM2 helps mediate the functions of microglia in response to disease, including how they engulf cellular debris in the brain and trigger inflammation. 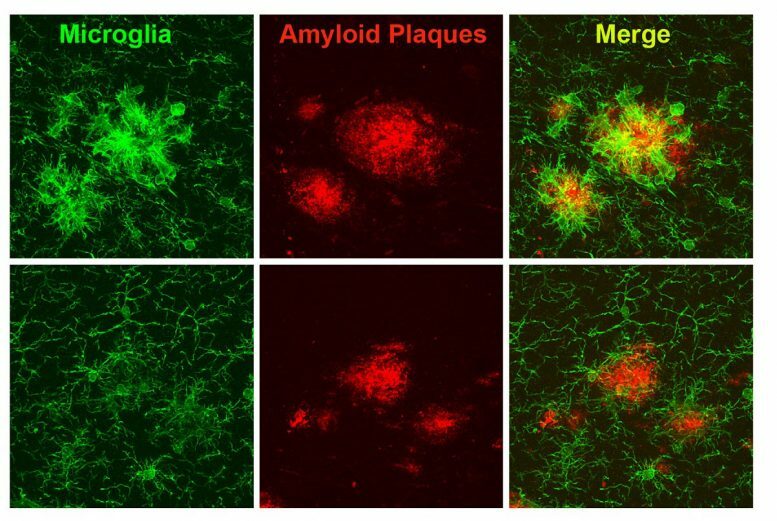 With a deficiency of TREM2 function, microglia fail to respond properly to surround and contain a type of protein in the brain known as an amyloid that clumps together in the brains of those with Alzheimer’s. However, it has been unknown whether increasing levels of TREM2 could help to enhance microglia’s helpful functions, or whether the increased levels would lead to an overactive and unwanted immune response in the brain. Yang and his colleagues at the Semel Institute for Neuroscience and Human Behavior at UCLA and the Geffen School engineered a large circular DNA molecule — called a bacterial artificial chromosome — that contained the intact human TREM2 gene. Injecting this chromosome into mouse eggs allowed the researchers to produce mice with higher-than-usual levels of TREM2. The scientists carefully designed their study so that TREM2 was accurately expressed only in the microglia, similar to its normal expression pattern in the brain. They then bred these mice with a mouse model of Alzheimer’s disease known as 5xFAD to produce mice that had both high levels of TREM2 and a propensity to develop some, but not all, of the features of Alzheimer’s disease, such as amyloid plaques and inflammatory changes. By four months of age, mice with 5xFAD usually have started accumulating amyloid plaques in their brains, one of the early signs of Alzheimer’s. By seven months, brain cells have begun to degenerate and the mice are performing poorly on memory tests. However, when the mice with 5xFAD had genetically elevated levels of TREM2, the disease course changed. The mice had fewer amyloid plaques, and those they did have had shifted toward the less harmful types. The 7-month-old mice performed better on memory tests, with results comparable to normal, healthy animals. “Thus, increasing TREM2 levels in the mouse model improved several characteristics that are reminiscent of those found in patients,” Yang said. The increased TREM2 also reversed cellular and molecular signs of Alzheimer’s disease, decreasing the expression levels of dozens of classical markers of inflammation in microglia, while boosting other functions of microglia, including their ability to clean up cellular debris. The effect of TREM2 wasn’t specific to 5xFAD mice. When Dr. C.Y. Daniel Lee and Dr. Anthony Daggett, two co-first authors of the paper, repeated the experiments on a second mouse model of Alzheimer’s — known as APP/PS1 — which has a slower-progressing form of Alzheimer’s symptoms, the results were similar: When TREM2 levels were boosted, both the cellular and behavioral signs of Alzheimer’s were improved. Whether TREM2 has the same role in human Alzheimer’s as in the mouse models is unknown, Yang said. And while the scientists engineered mice to have higher levels of TREM2 throughout their life, it’s unclear whether increasing levels when disease symptoms begin would have the same effect in their models. “We’re cautiously optimistic about our new findings, as it provides fresh impetus for the field to study how to harness the untapped potential of the brain’s immune cells to prevent or treat Alzheimer’s disease,” Yang said. The group next plans to study the molecular mechanism by which TREM2 is changing microglial function in Alzheimer’s models, and to explore whether higher levels of TREM2 could also alter the microglia response and disease outcomes in models of other degenerative brain disease. The study’s other authors are Xiaofeng Gu, Peter Langfelder, Nan Wang, Chang Sin Park, Yonatan Cooper and Giovanni Coppola, of the UCLA Center for Neurobehavioral Genetics at the Semel Institute; Isabella Ferando and Istvan Mody of UCLA department of neurology at the Geffen School; and Lu-Lin Jiang, Xiaoguang Li, Yingjun Zhao and Huaxi Xu of Sanford–Burnham Prebys Medical Discovery Institute. The research was supported by the National Institutes of Health, the David Weill Fund at the Semel Institute, the Leslie Gehry Brenner Award from the Hereditary Disease Foundation, the Tanz Family Fund and the Cure Alzheimer’s Fund. Be the first to comment on "Boosting TREM2 Protein Levels Improves Alzheimer’s Symptoms"